These days you need to get off the beaten track just a little to reach Woodend. By-passed by not so recent upgrades to the Calder Highway it's a detour well worth the effort if you find yourself at the Holgate Brewhouse, the modern incarnation of the 100 year old former Keatings Hotel. Situated in the heart of Woodend, in the shadow of the town's famous clock-tower, the Brewhouse is the brainchild of Paul and Natasha Holgate who were inspired by the thriving microbrewing industries they chanced upon in Europe and the USA while travelling in the 1990s. 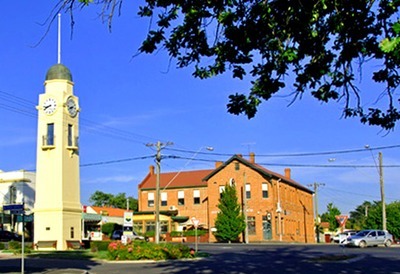 The Brewhouse is located in the heart of Woodend, in the shadow of the famous clocktower. 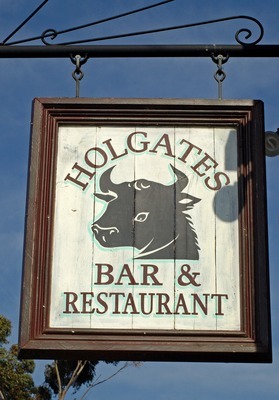 Since starting the business in 1999 and taking over the hotel in 2002 the Holgates have embarked on their mission of producing a classic range of beers and matching them with local gourmet foods in a convivial and inviting environment. The brewery sources hops from Australia, New Zealand, USA, United Kingdom and the Czech Republic and combines them with malts from Australia, Germany and the Untied Kingdom. Holgates core range of Pilsner, Mt Macedon Ale, E.S.B. and Temptress are complimented by a diverse and tempting range of seasonal special releases. The Holgate's take great pride in the fact that they do things the old fashioned way, using just four ingredients, Malt, Hops, Yeast and pure Macedon Ranges water. They use absolutely no preservatives, artificial colouring or flavouring. The result is a range of unique full-flavoured ales and lagers capable of satisfying almost any taste. Holgates Brewhouse restaurant serves a mouth-watering range of meals using the best local ingredients prepared under the discerning eye of Natasha Holgate. Many are cooked using Holgate beers and all are served with an accompanying suggestion as to which Holgate brew best compliments the various dishes. Holgate Brewhouse is more than a pub, it's a life-style experience where the brewery takes pride of place but is complimented by the restaurant, bar and lounge, courtyard dining facilities, a function room and its stylish accommodation. Holgate's offer good old fashioned beer free of preservatives, artificial colouring or flavouring. With a motto of "Real Beer, No Bull" it's hard to imagine finding a more relaxed environment in which to enjoy the brewers art. When: Monday's 2PM til late. Tuesday til Sunday 12 Noon til late.